PORTSMOUTH, N.H. — We were up and at ‘em bright and early on Wednesday in Bar Harbor, Maine, with a long day of riding ahead to Portsmouth. The weather was still sloppy, but we were optimistic that the chill and moisture would soon dissipate. The first leg was uneventful and easy, other than having to deal with the ongoing stop-and-go associated with road construction. I think Duffy Stenger suggested after our sixth stop of the morning that Maine might be renamed “the road construction capital of the world.” My achy throttle hand and I would have to second that motion. About two hours in, we rode through the vibrant town of Camden, Maine. Postcard-pretty, its streets were lined with lovely estate homes, impeccable grounds, plenty of colorful blooms, a hip, rejuvenated downtown area and, best of all, bright yellow sunshine! There were a few happy dances in the saddle as sunshine magically transformed our day for the better. 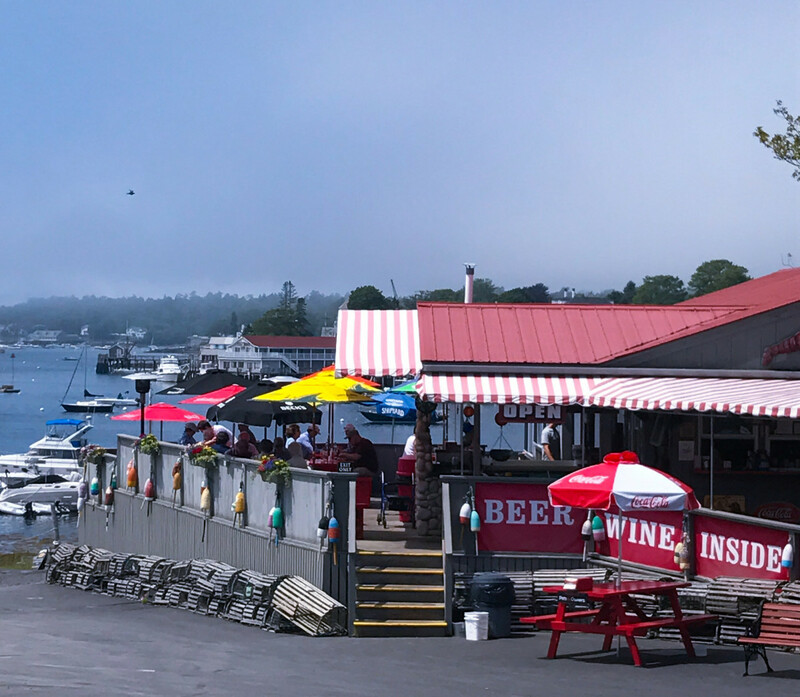 One of the places I’ve longed to visit is Boothbay Harbor, and Jim Krueger had slated it for our lunchtime stop. We didn’t have long to stay, but it was long enough to dine on the waterfront and work in a quick stroll to the downtown hub a few minutes away. 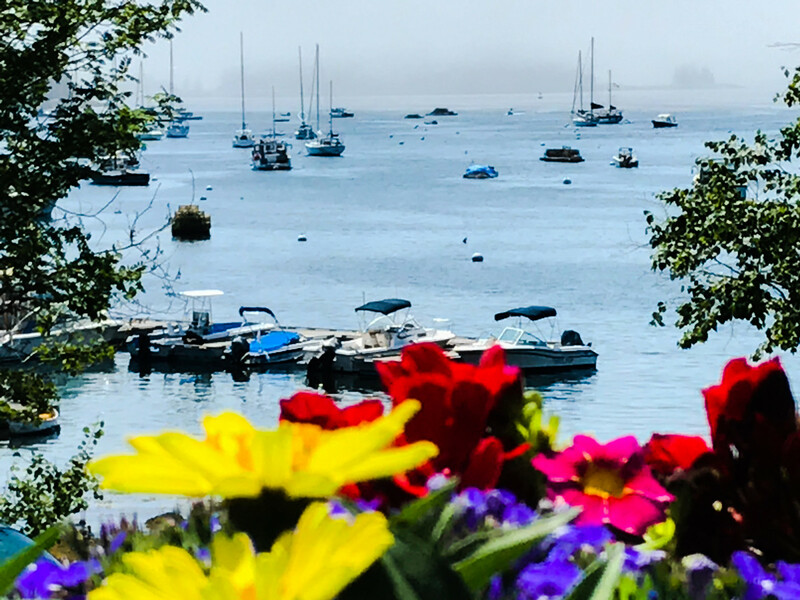 A beautiful view of Boothbay Harbor. OK, OK, I know it seems that every column addresses food, but truthfully, enjoying meals together is part of the whole biker experience. We love to discover and introduce great new watering holes where we can sit with friends, relax, talk about bikes, eat, talk about bikes and eat some more. Tip: If you ever drive by and see a bunch of motorcycles in front of a restaurant, chances are the grub is going to be good. Krueger had researched and found a local favorite, the Lobster Dock, right smack dab on the harbor. You walk up, choose from a huge assortment of menu options, pick an indoor or outdoor table and shoot the bull until your meal arrives. The Lobster Dock was a big hit with the hungry crew of tour riders. So far this trip, I’ve OD’d on lobster. I’ve had a lazy lobster, lobster po’ boy and a lobster bake, but I have been eagerly anticipating my very first bite into a lobster roll, which happens to be the official title of this year’s tour. Other places we’d stopped had lobster rolls, but I’d been told the hot ones were better than the cold, so I waited for that perfect place and time. This was it! The lobster was chopped into bite-sized chunks and mixed lightly with warm butter. It spilled over a lightly toasted, buttery roll, and I swear it screamed, “Eat me!” I devoured the whole thing and licked my lips when I was done! In addition, I shared bites with friends of the homemade strawberry rhubarb pie and homemade blueberry pie a la mode — both were outstanding! It was another lobster feast; everyone was fat and happy. 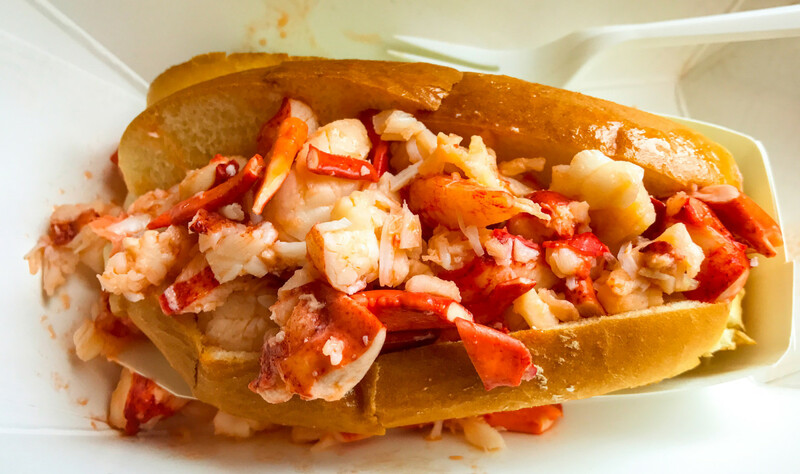 Our 2017 tour inspiration, the lobster roll. Yes, please! As we prepared to depart, many of the crew rolled up and packed away jackets, opting to ride in short sleeves because the temps were climbing into the 80s. We had to jump onto the interstate to pick up some time, and while we were able to run at wide-open throttle that happy sun baked us! About half an hour from our destination in Portsmouth, one of our riders pulled over to express concerns about his bike. At higher speeds it had begun to grind and growl, and not in a positive way. It was determined that the chase vehicle and another rider would follow him to the local Harley dealership 25 miles away so they could confer with the service department. 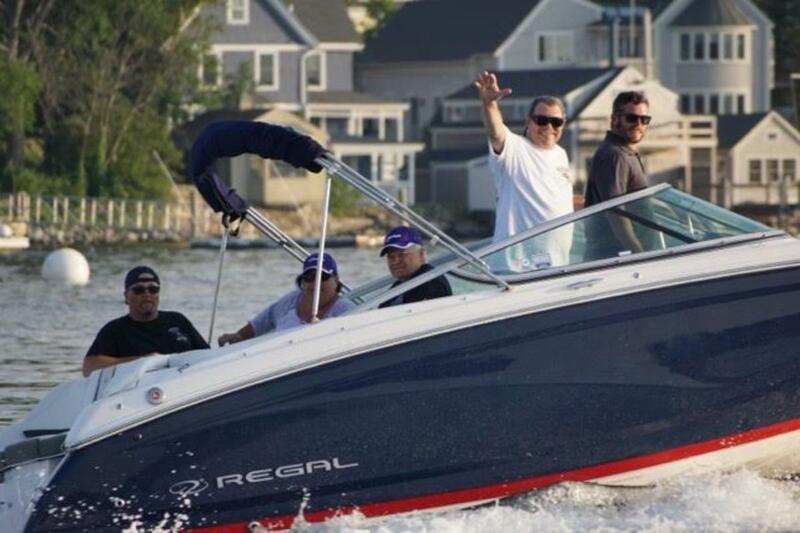 The rest of us hightailed it to Freedom Boat Club of Portsmouth at Portsmouth’s Sagamore Creek. We arrived a few minutes ahead of schedule and backed our bikes right up to the front door of the awesome clubhouse. We were initially greeted by one of the friendly dockmasters, Connor Farrington, who warmly welcomed us to the club. We had plenty to chat with him about, as he’s a passionate boater and biker, too! Icy cold sodas and snacks were awaiting us, and we were happy to oblige. We appreciated the opportunity to use the facilities and to rinse off the road grime. I was thrilled to peel off the long pants and riding boots in exchange for flip-flops and more comfy boating attire. We were so excited to go boating! 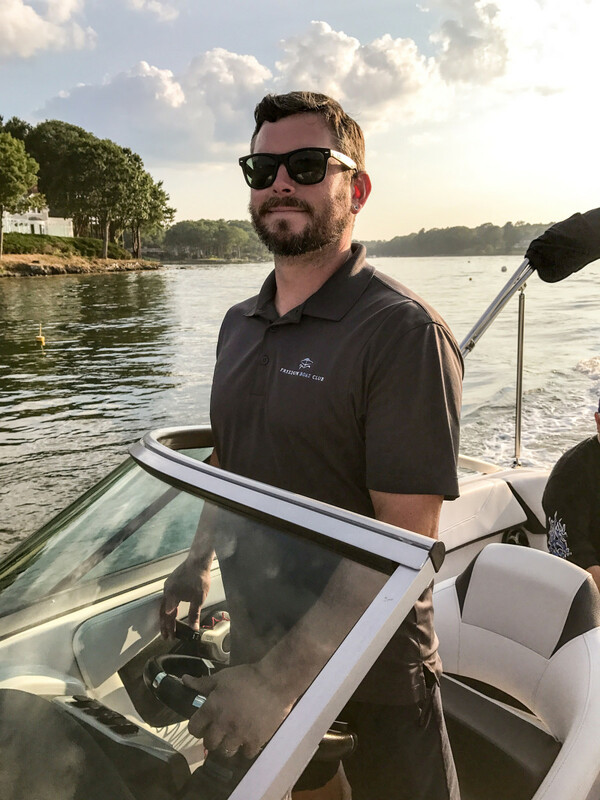 As one of the event sponsors, franchise owner Jake Goodridge of FBC of Portsmouth had graciously agreed to take our boaters and bikers for a sunset cruise aboard two of his most popular fleet boats — a Regal 23-foot deckboat and a Key West 239 dual console. Before heading out we staged a photo shoot with the crew, sadly without our two MIA couples, who were dealing with bike issues. Riders with their bikes in the background join Team Freedom Boat Club in Portsmouth, N.H.
Before we get on to the ride, a quick backgrounder. FBC of Portsmouth is one of 130 Freedom Boat Clubs in North America and one of 16 in New England. Jake and his father, Mike, launched their first FBC location in Newburyport in 2006, followed by Portsmouth in 2008. Between the two locations they have 220 members and 27 boats in the fleet, including a mix of Regal, Scout, Key West and Crest pontoons. Business is booming, and Jake is working feverishly to secure more slip space to accommodate demand. He owns the Portsmouth club location and his father just purchased a 50- to 60-boat marina in Newburyport at Yankee Landing that will provide for much-needed expansion in 2018. Capt. Jake Goodridge of Freedom Boat Club of Portsmouth stands at the helm of a fast-growing business. I have to say this venue is one of the two nicest FBC clubs I’ve had the pleasure to visit, even providing personalized member cubbies to stash boating gear. Ready to go boating? Show up, grab your gear and go! They also have a snack shop, offices and an upstairs multipurpose room, where they host seminars and special member events. Jake and Mike bought the place in the spring of 2008, along with the adjacent prime real estate next door. We followed Jake and his crew down to the docks, passing an elevated and cozy sitting area with a fire pit. We then boarded the boats at the dock, and they were in great shape. We split our crew between the two models. I rode with Jake aboard the Regal and Connor captained the Key West. Riders enjoyed a sunset ride aboard two Freedom Boat Club of Portsmouth fleet boats, including this Regal deckboat. What a thoroughly wonderful and relaxing ride we experienced! We cruised past the high-dollar Wentworth Marina, with its sleek yachts, including some European beauties. We passed stunning waterfront mansions in the upscale New Castle community. The water was calm as glass as we drove through the Atlantic Ocean en route to the trendy section of downtown Portsmouth. We saw clusters of paddleboarders out for fun, late afternoon gatherings. We passed the historic Portsmouth Naval Shipyard, established in 1800, and also home to a massive, but deserted Navy prison. We all agreed: This was a fantastic place to go boating! 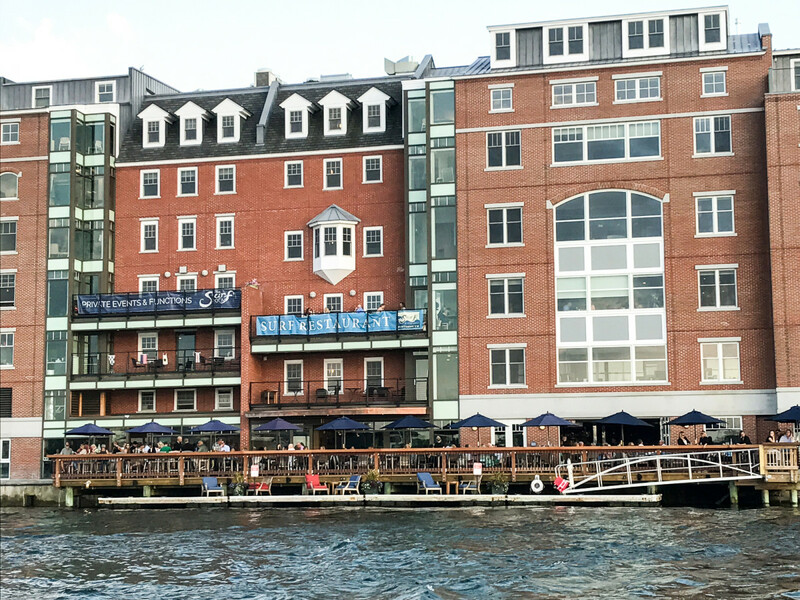 We cruised past the trendy downtown Portsmouth hot spots. After a few hours we returned to the dock totally relaxed, the golden sky turning to the soft pastels of sunset. 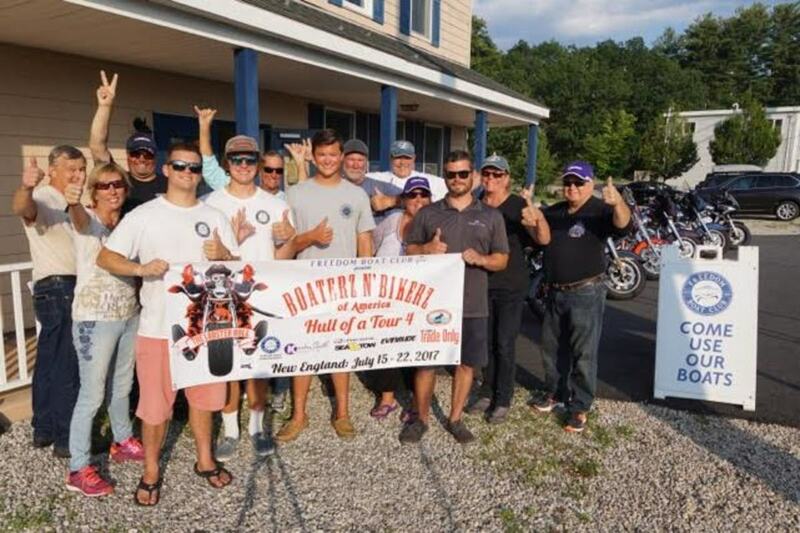 We’d enjoyed two of our very favorite things in life, and that is exactly what this tour is all about — celebrating boating and motorcycling! Life just doesn’t get much better than this. Tomorrow, we’re scooting down the highway to Cape Cod, where we plan to hook up with our friend Randall Lyon and some of his board members from the Massachusetts Maine Trades Association for an evening event. I have a feeling things are going to get very ducky! Tune in tomorrow for the latest, and thanks again for coming along for the ride!